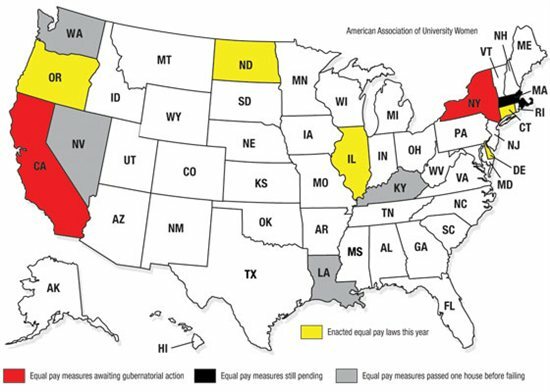 Over 20 states have considered gender pay equity bills this year. A few have been signed into law, though none with quite as much teeth as one passed this week by the California Legislature. Gov. Brown has already said he’ll sign it. Two other significant California equity bills are also close to getting to Brown, all of which are models for the rest of the country. In fact, according to this article courtesy of LexisNexis® State Net, 5 states have enacted laws this session aimed at narrowing the wage gender gap. Equal pay measures are also awaiting gubernatorial action in two states and are still pending in one other. And although 21 states considered equal pay measures that ultimately failed, in four of those states the bills passed the first house and the AAUW expects them to be reintroduced. If you would like to receive more information similar to the above, sign up for the StateNet Capitol Journal Newsletter. The above article and image are courtesy of State Net Capitol Journal.